You’ve seen the iconic three blue men in posters across the largest cities of the US. Now, Blue Man Group is on tour, and they are bringing their show –and business lessons- to a city near you. Created by a group of friends in Manhattan, this variety show took off to become one of the most famous off Broadway shows. It’s the perfect –yet unexpected- place to look for business lessons. This blog is a look at the entertainment industry and the lessons it has to offer in business. With a mission like this one “Blue Man Group is a creative organization dedicated to creating excitement-generating experiences for our audience and ourselves” it’s a perfect place to learn about creativity. From their iconic image with paint drums to their hypnotic drumbone music, this group of comedians has some real imagination from start to finish. Bring some creativity to your office; expand it to your work and to your thinking too. Check out the story of how these three friends came together in their Youtube official site In it, they explain how they created their own instruments. Without them, it could have been just another drum show. Imagine now, making music out of plumbing pipes and how that holds an entire room’s attention. Build things at work, prototype new ideas, play with different materials to come up with some unexpected new products. It might just bring the color and sound your company needs. In the same video, two original members explain how their inspiration came somewhat from the Vaudevillians, an entertainment idea in the 1880’s and 1930’s. Interestingly, they point out that they didn’t know how to do much with any entertainment value, except catch things with their mouths. Now, a marshmallow throwing sketch forms part of every show. We all weren’t meant to be jugglers, sword-swallowers, or drum percussionists, but we all have our unique skills. Easier said than done, find your best business ones and use them. The premise of the show – I think – is three blue men having fun, playing music, and learning about technology. And throughout the entire performance, one always tries to stand out from the other two. The most evident scene is when (spoiler alert) one performer lights his drums with Christmas lights leaving the other two with pretty dull black barrels (end spoiler alert) Don’t lose sight that your job is a competition, and to be recognized, you need to stand out from what could be a pretty generic -and in this case blue- group of people. 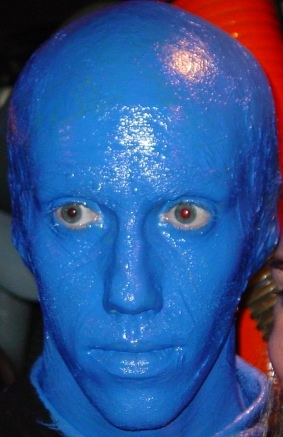 Their creators admit the blue men are pretty strange at first sight. If they look funny in posters, wait till you see them in the show. After a while they grow onto you, your partner, the person sitting next to you, and the kid jumping in front of you. The show has found the perfect sweet spot to appeal to all ages – a task not easily accomplished by even the most recognized marketing companies. Challenge yourself to make your company, your product, your business appeal to more people and that’s what gets you sold-out shows. If you decide to see a show beware, you might get pulled in, literally. The cast does an outstanding job engaging the crowd in sketches and segments of the show, but I won’t share much so you go see them live. This entertainment, which connects at a whole different level, is something that’s made them so successful. Does your company offer something as engaging? Something that lets the consumer enjoy and makes them part of the show? If not, you’re missing out on a captive audience. Since not everyone can make it to New York, Vegas, or Orlando, the Blue actors have taken their show on the road again. Don’t settle with the status quo of distribution, if your customers don’t come to you, go after them. I happened to catch their latest show in Fayetteville, Arkansas where they kicked off the 2012 national tour. For those who don’t follow College Football, Fayetteville is home to the University of Arkansas’ Razorbacks. Halfway through the show, a Blue Man put on a Razorback Hog Hat and the crowd cheered on, fist pump and all, “calling the hogs”. As you market your business, or even yourself, follow in their blue footsteps and tailor your message to each market. Woooo, Pig Sooie! is what worked here but surely nowhere else. In July 2011, the group celebrated 20 years of entertaining. Check out some scenes and more on their facebook site here. I’d say the secret to their success is sticking to what they do best, and adjusting just slightly to keep it fresh and fun. I’ve seen their act more than once, and I’d think about 80-90% remains fundamentally the same, yet it doesn’t grow old. Add on top of that the new 10-20% and it keeps me coming back. Do the same with your products or service, stick to what it does best but upgrade it 10-20% every so often to keep customers coming back for more. Entertaining is a pretty common practice and some people and/or industries do it better than others. We all have to do it, at home, in meetings, approaching our consumers. The Blue Man group, with its unique spin on it gives you those lessons to become successful at it too. Really like points 4 and 7.